DETAILS The computer offers all sorts of possibilities for craft projects. 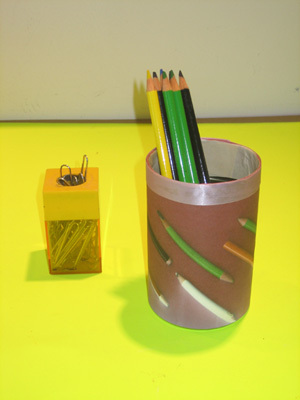 For our pencil holder we put pencils in our scanner and covered them with an 8 1/2" piece of red construction paper, keeping in mind the size of the can as we placed the pencils. We printed the results and cut the paper to fit the can, leaving an additional inch and a half to fold over the edge. We glued the paper to the can, folding over the extra paper, tucking it as neatly as possible inside. This we covered with some wide masking tape. Wanting a more finished edge, we glued on some gift ribbon. Somebody's going to get a nice present. Maybe Dad.